Meathead Movers is here to take care of the heavy lifting for you on your move to Van Nuys. Our clean-cut student athlete movers are ready to get you safely settled into your new Van Nuys home. If you are relocating to the Los Angeles area and would like to settle down in a community that has a little bit of something for everybody, Van Nuys is a worthwhile choice. Several celebrities hail from this friendly Los Angeles neighborhood, which is located in the San Fernando Valley and includes housing options for just about every budget. In the scheme of things, Van Nuys hasn’t been settled for very long. It’s managed to make quite a splash during its short history, though. The neighborhood’s biggest claim to fame through the years is Van Nuys Boulevard, which used to be the most popular cruising strip in Los Angeles. The LAPD put a stop to everyone’s fun during the 1980s, but the stretch is still a nice place to explore. There are plenty of other fun places to explore in Van Nuys. After your move is complete, make sure to check out the Japanese Garden, which has been ranked 10th in a list of the United States’ best Japanese gardens. It’s also been used as a location for shows like Star Trek: The Next Generation, so it might even look familiar to you. The Van Nuys Golf Course has an 18-hole, par-three course and a decent driving range. On hot days, head over to the Van Nuys Sherman Oaks Pool for a refreshing swim. You can also check out the variety of historic buildings in the city including Van Nuys High School, which boasts famous alumni like Robert Redford and Paula Abdul. To get your belongings there safely, you are going to need to hire reputable and reliable Van Nuys movers. In that case, you can’t do better than Meathead Movers. Our highly-trained team of student athlete movers will make your move to Van Nuys as smooth as possible. Our moving company specializes in local, long-distance, and commercial moves to, from, and within Emeryville. Our signature moving concierge services can connect you with a wide range of local services, from handymen to babysitters. You can trust Meathead Movers to always provide superior service and excellent customer service. If you need help packing, you can even hire our Princess Packers to ensure that even your most fragile possessions are packed away safely. You’re sure to love life in Van Nuys. 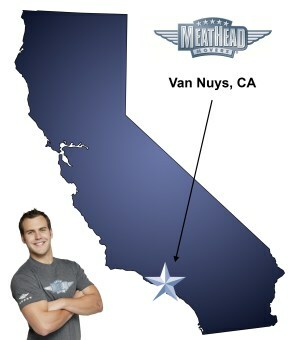 Contact Meathead Movers today to book your Van Nuys move today. Our respectable clean-cut student athlete movers will ensure that your possessions are moved safely and efficiently. For superior service, Meathead Movers is the moving service to trust, so contact us today and find out how we can help you on your next move. Moving to Van Nuys? Here are some helpful resources. View more Van Nuys resources. We used your company a number of times. Small and large moves. Always excellent service from start to finish. Great attention to detail. Best movers ever. Your movers are great. Please keep up the good training. Their care, consideration and great attitude are unique and should make your company a leader in its field. Martin and Hector are fine young men. Fast and Fair. Meathead is the best. I came in today to do a walk-through of my apartment and there are skuff marks from one of the dresser or cabinets they were carrying. I had to empty my entertainment center which when I spoke with my sales rep and another individual from the main hotline I confirmed both times I would not have to. A separate cabinet with bottles in them I had to not only empty but then carry a heavy box by myself and transport on my own because the mover told me that they could not move alcohol. This was not told to me A small, plastic book case was not brought in the move. I had on my moving sheet a small bookcase and medium bookcase, lamp, vacuum, various other smaller items that ultimately I did not have. I was being cautious but when an item I had on the moving list was not moved I feel ripped off. Ultimately it cost me $1700 to go 14miles, my apartment floors were damaged, items were left behind and I'm generally upset. I did not notice any of this until I did my walk through today when it's too late to do anything. Excellent professional team from beginning to end!